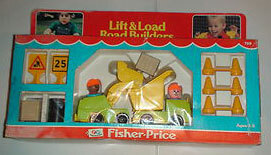 Description: This is a 12-piece Original Little People construction set including 2 tireless construction workers, 2 construction vehicles, and various construction equipment. The only exclusive piece is the yellow road sign with a construction worker design, thus is it the most hard to find piece in this set. FPT411 - Green (Lime Green) 1-seat front loader (scoop loader) with a Yellow spring-loaded bucket on the front that moves up and down. Rolls on 4 black knobby wheels. FPT416 - Green (Lime Green) 1-seat dump truck with a Yellow spring-loaded bucket on the back that tilts. Rolls on 4 black knobby wheels. FPT260 - 2 each - Round black plastic oil drum with four molded ribs on the sides. Measures 1-1/8" diameter, 1-9/16" tall. FPT232 - 3 each - Two yellow plastic cone-shaped roadway warning pylons that are attached together near their base with a thin connector strip. FPT223 - Small yellow plastic sign with a square top that has a black imprint marked "25 MPH" and WITH a square black border outline around the edges. The sign has a short post and a square base. *See "Variations" below. FPT230 - Square yellow sign with a red triangle and a black shadow picture of a construction worker shoveling something. The sign has a short support post and a square flat base. TPP - Caucasian light blue construction workers with an orange hat and scarf. SPP - African-American light blue construction workers with an orange hat and scarf. This set was sold in a 16" long, 6-13/16" high, by 2-5/8" deep display box.